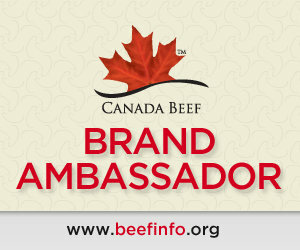 My first official assignment as a Canadian Beef Ambassador is to share with you the parts of the BeefInfo.org site that I like the most. There’s a whole section dedicated to Health Professionals focused on nutrition, research and resources, enough to satisfy most food geeks looking for data to feed their minds. Cooking lessons that include a step-by-step breakdown of each step in the basic technique (like Barbecue Roasting); and a set of recipes you can use to try the technique out; and a series of videos (short and long) of the recipes being made. Beef Radio – a series of podcasts from Registered Dietician Hélène Charlebois sharing tips on nutrient-rich eating. And obviously, there are Recipes galore! Quick and Easy recipes from scratch, a list of the 10 most popular recipes (slow cooker pulled beef to Vietnamese flank steak noodle salad aka nuong bít tet bun), downloadable recipe booklets and even blog posts from the Test Kitchen. But my favourite section of the site is Cool Stuff where there are great quotes and photos of the people involved in raising the beef we eat; recommendations of cookbooks like Molly Steven’s All About Braising and James Peterson’s Meat: A Kitchen Education; and facts to help us shop more intelligently and get the beef we want, like the video on Beef Packaging Facts that’s just hanging out in the sidebar. BeefInfo.org is rich with information on why to eat Canadian beef; how to buy the best beef for your needs, and what to do with it when you get it home. I won’t inundate you with fact and figures right now, I’ll leave that for your own exploration of the site. Photos used in this post are from BeefInfo.org.